Young Dutchman Koen Bouwman emerges from a six-man breakaway to win Tuesday's 184km third stage of the Critérium du Dauphiné. Tullins, France (AFP) — Young Dutchman Koen Bouwman emerged from a six-man breakaway to win Tuesday’s 184km third stage of the Critérium du Dauphiné as the favorites kept their powder dry. Belgian Thomas de Gendt held onto the leader’s yellow jersey ahead of Wednesday’s 23.5km time-trial, which should see a major shake-up in the overall standings. Three-time winner Chris Froome will expect to move into yellow jersey contention ahead of a weekend where the overall winner will be decided on summit finishes at Alpe d’Huez and Plateau de Solaison. And Froome said gaining time on his overall rivals, such as Romain Bardet and Alberto Contador, would make a major difference for the rest of the race. “It’s going to be a huge dynamic of the race here. Whoever gets time tomorrow [Wednesday] in terms of the GC battle won’t necessarily have to go on the offensive in the following days,” said Froome. “It’s an important milestone in this week’s race, but it’s also an important test in terms of the Tour de France. Bouwman, 23, proved strongest in the sprint amongst escapees with Lithuania’s Evaldas Siskevicius second and Frederik Backaert of Belgium third at the finish in Tullins. “I can’t believe it. My parents and my girlfriend are watching me on the television. I never thought I would win here in such an important race as the Critérium du Dauphiné,” said Bouwman. The six breakaway companions had set off early into the stage and held a lead of almost seven minutes at one point. The peloton took too long to take up the chase and was led home by Frenchman Arnaud Démare, the winner of Monday’s second stage, 11 seconds behind Bouwman. 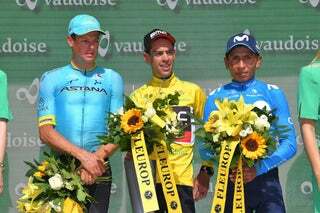 VN Show: Suisse vs. Dauphiné: Which is the better TDF prep race? Dauphiné roundtable: Is Thomas a bona fide Tour contender?